This paper examines parallels between the evolution of spot markets jor oil during the 1980s, particularly Brent, and what is now happening in the UK gas industry. The structure of supply, formerly within the control of British Gas, is breaking up under antitrust and regulatory pressures, and the short-term balancing needs of the system are being externalised. This is giving rise to a spot market. This paper identifies four stages in the development of a spot market, of which the UK market is presently in the first and second stages (physical balancing and the development of price transparency). Feedback effects on prices are already apparent, and the fourth stage, the development of risk management tools, is being discussed. This scenario was drawn up three years ago, based upon the experience of oil before the existence of a gas spot market was acknowledged. It has so far not missed a step. According to this analysis, the question over the extension of this logic to the gas markets in Continental Europe is not whether, but when? In this paper we apply time-varying parameter (Kalman Filter) analysis to measure the degree of price convergence in North American natural gas spot markets. This statistical approach allows for an assessment of the strength of price convergence across various gas-producing basins. It is also a technique better suited than cointegration analysis because of the explicit presence of time varying parameters. Our results indicate that price convergence in natural gas spot markets has increased significantly since the price deregulation of the mid1980s. However, results to date indicate that there is still some way to go before one can speak of a single North American market for natural gas. This paper derives Ramsey prices for the realistic situation in which bypass costs are unknown to both a regulator and an electric utility, in particular, to any useful level of precision. It is shown that the traditional inverse elasticity rule will still yield Ramsey prices that are incentive compatible. The Ramsey prices require relatively little information to implement, and we show the relevant elasticities to use. Modifications of these Ramsey prices that account for political realities are also provided. 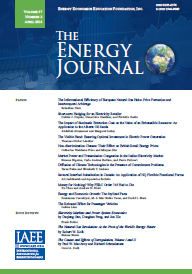 This paper examines the costs and benefits of a Norwegian energy conservation program that provided financial support for investments in energy efficiency. Participants in the program included industry, commerce, public services and households. Evaluation of the program shows that about 70% of the participants were "free riders' who would have invested in efficiency improvements even in the absence of the program. The economic efficiency was further reduced by economic distortions caused by taxes needed to finance the program. However, the energy savings did give environmental benefits through reduced atmospheric emissions, although this effect was somewhat diluted through a "conservation rebound," where the actual reduction in energy consumption was less than the theoretical savings. The energy conservation program is also highly sensitive to assumptions about the economic lifetime of the investments. Gasoline consumption creates externalities, through pollution, road congestion, accidents, and import dependence. Mat effect would a higher gasoline tax have on the related magnitudes: gasoline consumption, miles driven, and road fatalities? In this paper, separate models are estimated for gasoline use per mile, miles driven per driver, and fatalities per mile driven. We use data from 50 U.S. states and DC for 1970 through 1991, with a variety of stochastic specifications. The own-price elasticity of demand for gasoline is derived from projections with, and without, a higher gasoline tax, and is found to be between -0.12 and -0.17 in the short-run, and between -0.23 and -0.35 in the long-run. A tax of $1 per gallon would cut use by 15-20%, miles driven by 11-12%, and fatalities by 16 18% over 10 years, while raising almost $100 billion in revenue annually.